The ship docks in the Port of Bruges-Zeebrugge, an industrial port with some passenger ship facilities. About 2 kilometers from Blankenberg. 15 km from Brugge (Bruges). The Port Authorities provide a free shuttle bus from your cruise ship to the port exit. You have to take this bus as you are not allowed to walk in the port itself. To get to Brugge you can take the train from Blankenberg. The ticket one-way to Bruges costs 3 €, in the weekends even less. There is a train every hour, in the morning and evening every half hour. Check the return times of the trains before you venture into Brugge. Times may differ in the weekends. The trip is only 15 minutes. There is a tram service from dock to train. The tram costs you 3 euro per person from the driver or €6 day pass in Spar shop close to tram stop opposite the church. Validate ticket on entry to tram at machine and press button 1. The tram runs every 15 minutes. Where the port shuttle drops you off, turn right and walk for about 500 meters to the Zeebrugge Kerk (church) bus station. Get off at Blankenberg train station. The Spar shop is closed on Mondays. As of 2016 a two way shuttle service from Zeebrugge to Brugge and back is operational for the Cruise Passengers. Euro 20 for a return ticket. It is still a 15 minute. but pleasant walk from the drop off point to the center of Brugge. Often cruise lines offer a shuttle to Blankenberg train station at an inflated price of 10 euro. In case you miss the train, you can also take the bus to Brugge, leaving from the same station. If you are part of a larger group a taxi is another option, fixed price 50 Euro one way. The seafront promenade of Zeebrugge is within walking distance. 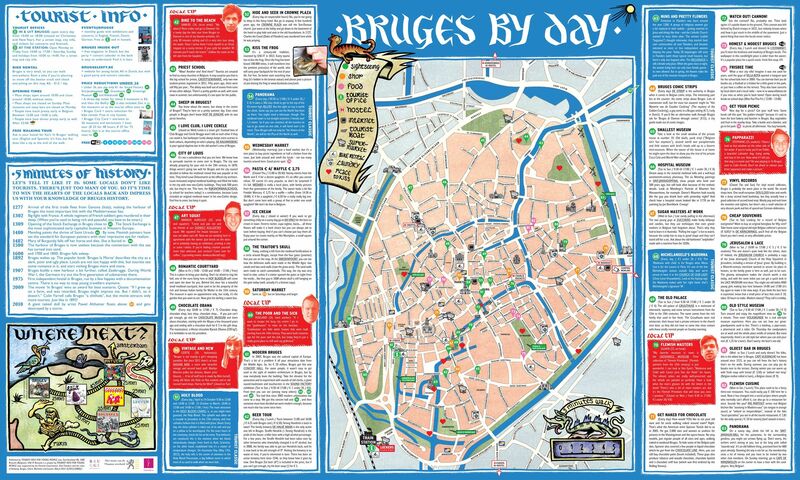 Printable map of Zeebrugge and Brugge to take along. Check here for festivals and events in Bruges when you are in port. Zeebrugge and Blankenberg, get off a Blankenberg Pier tram Station, are small coastal tourist towns, which if the wheather is inclement, will be boring to visit. For a leisure day along the coast take the Coastal Tram a public transport service connecting the cities and towns along the entire Belgian (West Flanders) coast. 6 Euro for a day pass if bought from the Spar shop close too the tram stop. If bought from the driver it will be 2 Euro more. Bruges incredibly well-preserved medieval architecture makes it one of the most exciting tourist attractions in Europe. Besides architecture, sites to see include several museums. First is the Groeninge Museum, with six centuries of paintings from different styles, including works by Jan van Eyck, a Flemish Primitive painter. The Memling museum is also not to be missed, with the wooden Shrine of St. Ursula. Also, the only work of art by Michelangelo to leave Italy during his lifetime, can be seen in the Church of our Lady. The Chapel of the Holy Blood also displays an ampul reputed to contain the blood of Christ. Of course a visit to Bruges wouldn't be complete without a canal or sightseeing ride carriage ride, sampling the chocolates and waffles, shopping for craft work including Bruges famous lace, visiting art galleries, climbing the belfry or trying several of the more than 350 available Belgian beers. The train station is about 800 meters from city center and is a pleasant walk on the cobble stoned streets. In Brugge mainly Dutch spoken, however English is well mastered. Stores in general 9am - 18pm Mon-Sat. Some (larger) stores stay open later. Almost all stores are closed on Sundays, except in tourist area as Brugge and the main coastal towns.